Haven't had one of these in a while. Now that I have upgraded my imaging armory with a nice entry level DSLR it's time for me to go about shooting my figures. 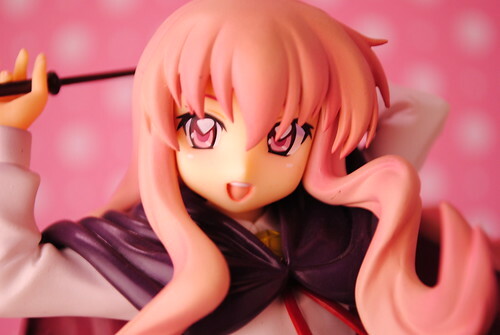 For this post I will take a look at one of my favorite Louise PVC figures. First things first, allow me to introduce Louise Françoise Le Blanc de La Vallière. 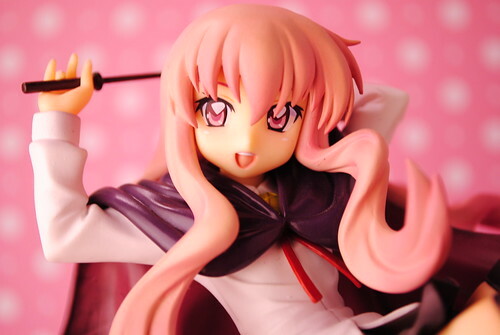 She is one of the main characters from the light novels and accompanying show and manga Zero no Tsukaima. Louise is a magician and part of the noble class who is allowed to use magic. At the outset of the show Louise for all intents and purposes is a dissapointment as a magician leading her classmates to nick name her "Louise the Zero". The summoning ceremony held by the students marks the beginning of the events that set the outset for the novels and anime. During this ceremony Louise summons a normal young boy from modern Japan by the name of Hiraga Saito as her familiar, thus the name Familiar of Zero. For those who frequently watch anime will know that Louise is voiced by tsundere queen Kugimiya Rie in the anime. Although not so much on the novels this title describes Louise in one word. As one would expect from Alter, Louise looks the part bearing perfect resemblance to her anime counterpart. The details on the face and eyes are well refined. 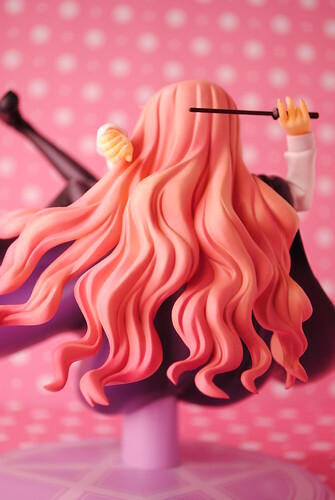 One of the details that I really like about this figure is Louise's hair. What could have been just one big clump of hair is instead several strands giving a more pleasant look to her long hair. Her want is removable and offerers no problem whether the want is being slided into or out of her hand. 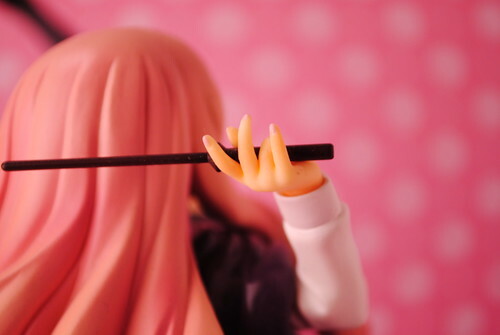 You can also appreciate the detail on her hand by looking at her manicured nails. 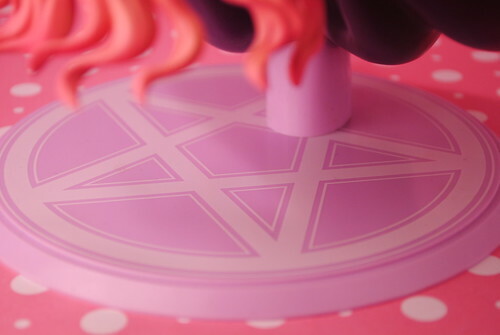 Louise comes with a simple circular base. This base is also a source of a complaint I have seen mentioned several times. Louise is screwed into the base meaning she cannot be separated from the base unless the screws are removed. Louise offers a healthy dose of Zettai Ryouki. A trait commonly associated with tsunderes. Louise also offers plenty of unobstructed view of her pantsu. Regardless of how you display her you will enjoy this lovely view. One of the things that attracted me to this picture was Louise's pose. First time I had seen a figure where the pose was a girl floating in the air. 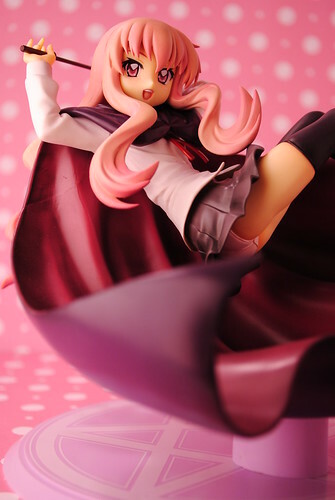 Louise is a 1/8 scaled PVC figure from Alter that was released during March 2009 making this an somewhat older release. 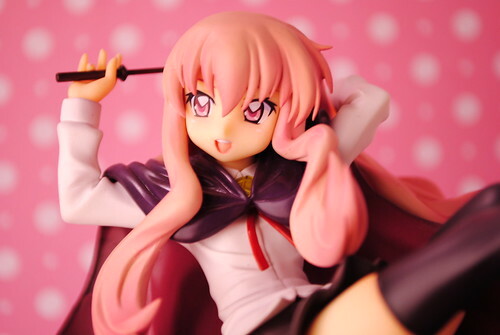 She retailed for 6800 yen and I picked her up from Hobby Search. If you are interested in more pictures of Louise you can find them at this flickr set. You can look at my other figure photo shoots here.